Martin cradles a remote control in both hands to steer the 175-foot (58 meter) robotic arm connected to a hose that discharges concrete from a 500-horsepower machine behind him. His eyes never leave the teammate. As one of Conco Pumping’s top boom pump operators, Martin is successful because he employees an acute sense of his surroundings while ensuring high volumes of concrete are safely and accurately placed on the job. While his primary focus is the team member holding the pressure-filled hose, Martin needs to listen to the machine closely and everything around him. He hears the cacophony of ready-mix trucks pulling up to the site, concrete moving from the truck chute to the hopper, the hopper feeding the pump and most importantly, the moment the hopper is about empty. That’s when there’s a subtle click that indicates the hose will soon run out of concrete and the pump must be shut down until more is loaded. 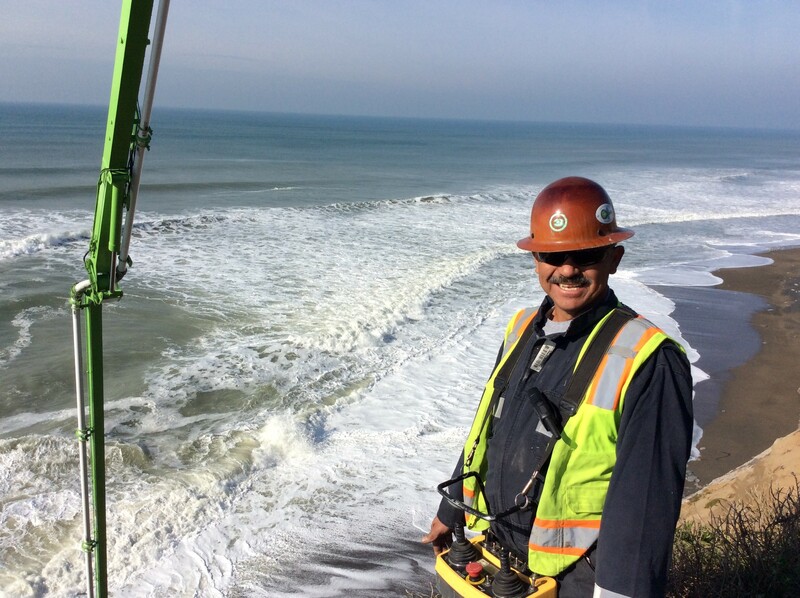 Martin has masterfully handled a concrete boom pump for 29 years, including more than 12 years at Conco. Over the years he’s acquired the skills that make him a trusted operator, someone who can safely manage one of the biggest pumps in the concrete industry and deliver clients high quality projects such as massive commercial building foundations and basements common around the San Francisco Bay Area. What Martin, a Newark resident, loves most about the construction industry is the ability to work hard and live what he considers the American dream. At age 17, frustrated with a lackluster economy and few career options, Martin joined his uncle in moving from Guanajuato, Mexico to California. At the time Martin didn’t speak any English, although he would become fluent in time. But he knew how to work, so he went straight to the union hall, ready to take any laborer job that came available. “This country can give you whatever you want, but you’ve got to work,” he said. A couple of years later, one of Martin’s boss’s handed him the controls to a boom pump, and he never let go. “I just loved the pump the first time I saw it,” said Martin, member of Local 3. There was one blow that took him out of the loop for a bit. In 2011, a small protrusion from Martin’s neck was diagnosed as non-Hodgkin’s lymphoma. He battled the cancer with chemotherapy and 13 rounds of radiation, and now doctors say he’s cancer-free. The eight months he had to take off from work gave Martin a renewed appreciation for life in general, especially work.